Enver Izmailov is an unique musician who invented "tapping" - a highly original technique of the electric guitar playing (he plays guitar with his both hands on the neck as if it were a keyboard) - knowing nothing about Stanley Jordan who invented the same in US at the same time. His music is a combination of many elements - jazz, Mediterranean and oriental folklore, classical harmony and astonishing virtuosity. Enver lives in Crimea, Ukraine (paradise-like giant peninsula in Black Sea) but was born in Ferghana, Uzbekistan. His two albums - "Eastern Legend" (solo work) and "Minaret" (trio recording) have been released by Boheme Music, Russia's only Jazz label. 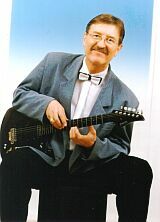 For a very long time, Crimean two-handed tapping guitar virtuoso Enver Izmailov has worked as a soloist. Then some duets appeared - with Turkish drummer Burhan Ocal, French keyboard player Xavier Garcia, British sax player Geoff Warren. This album, "Minaret", is the next milestone of Izmailov's creative career. Both Narket Ramazanov who plays sax, clarinet and flute, and percussionist Rustem Bari are Izmailov's old partners ad friends. They are working together since 1995, but it was only 1998 when they decided to record their project choosing Kiev recording company Arcadia Sympho. Trio's repertoire mainly follows its leader's ideas, but Izmailov aims to create a group where everybody plays equal roles. He tends to regard the whole trio as one instrument for which still no name is invented. The Minaret project that musicians suggest you to listen, includes seven pieces based upon musical folklore of Causasus, Middle Asia, Bulgaria and India and, as usual by Izmailov, mixed with elements of Tartar folk music. The musicians' technical skill allows them not to just affect folk instruments, but to actually reconstruct the original sound. The appeal of this trio's music is universal and hard to define. This is the sort of music Jazz musicians highly appreciate. An apposite definition of Izmailov trio's music was made by French musicians from Lyon - they called it "Imaginary Folk". As for me, this is a very accurate definition! From the other side, when you are listening to this recording, you have not to go deep into theoretical analysis of the music and, above all, you have not to try to understand everything at once. Izmailov, Bari and Ramazanov are very airy, cheerful and gifted persons. Maybe this is the source of their lightness, musical affinity and assertiveness. Arkady Vikhorev, sound engineer who made this recording, could tell you stories about how these musicians danced before him to explain some musical moments instead of finding words! "Talent is the only news that is always new", said Russian writer, Nobel prize winner Boris Pasternak. I cannot say I have had many occasions to recall this saying. This one seems to be very appropriate. I believe you would subscribe to Pasternak's thought, as you listen to music by Enver Izmailov, a guitarist from Zavet Leninsky (Lenin's Testament) co-operative farm in the Crimea. He has proved a great discovery for many devotees of improvisation around the world, and deservedly so. His music is a real treat. Yours truly realised that several years ago, when happened to hear Enver and his music for the first time. The one who discovers a new and wonderful world is bound to have an instant urge to find someone to share the excitement. This is how the idea of this record emerged. I don't believe in the power of words when it comes to music, but I must admit that sometimes words alone can induce people to learn something new. Due to frequent disappointments and the tremendous variety of records music lovers sometimes miss things extraordinary, sincere and keynoted by real talent. Enver Izmailov's is a world of sound meditation. In India it would be called dynamic meditation. His music is meditative and devoid of internal conflicts, which makes it so natural and close to nature. To put it in a nutshell, folk music is part of mother nature itself. It has always been and it will always be. I'm pretty certain about that. Enver Izmailov's music is indisputably rooted in the oriental instrumental tradition. Sometimes it sounds very much like passionate silence, often explosive in the oriental sense of the word. Its authenticity does not impede the musician's desire to experiment, although the opportunities classical tonal music playing offers are rather limited. Enver Izmailov is a 20th century person, and his compositions owe a great deal to modern improvisational chamber music, to jazz, if you wish. His is authentic whenever he wants to be so, but in other cases he easily goes beyond the bounds of what is already well known to him to create his own oriental eclecticism a professional ear will hardly notice. In music Izmailov can contemplate dancing and weep smiling, and from time to time he finds himself in the company of his "lonely guitar voice" alone. His ethnic roots are quick to manifest themselves. His manner and style of playing, the way he handles his instrument, and his arrangements of traditional Tatar, Uzbek and Bulgarian tunes sometimes take the listener to the Middle Ages, or let one feel the hot breath of the desert or rejoice at a wedding in South Moldova or Bulgaria with fresh wine, nuts and sheep's milk cheese and endless dances to the beat of the traditional bass drum. Some will probably recall, however odd this analogy may seem, modern electronic improvisations, including rock. What is most important, Enver never imitates. He has no preferences among the world's music authorities, and that is just wonderful. Even when he plays an encore, Brubeck's "Take 5" or any of the Beatles' 7/8 songs, he invariably sounds original. The ten-finger technique that makes his guitar sound like a piano or a whole orchestra including the percussion, is used by few guitarists in the world. Stanley Jordan, of New York, is the most famous of all. From the musical point of view there is nothing second-rate about Izmailov's compositions. His imitations of old lute-like folk instruments, such as the Uzbek dutar, Turkish ud and ancient lute are his own invention. His fingers make even a primitive model of a Japanese six-string electric guitar sound amazingly rich and colourful. The wide variety of timbres Izmailov achieves with the help of his very special touch. As he plays "Boina", one of the compositions found on this record, Enver Izmailov puts an ordinary handkerchief under the strings, which makes the guitar sound like a cembalo or something very similar to it. In the "Uzbek" piece, by tuning the guitar one fourth down he makes it sound like the Indian sitar. Izmailov never resorts to electronic effects, something almost all other guitarists do. Occasionally, he uses several guitars. For instance, in "Kapanitsa", a 11/8 Bulgarian dance, he plays four. One should also pay special attention to the title piece, "The Eastern Legend". In the middle of it Enver Izmailov touches the strings with a glass, which produces the effect of a synthesizer. On some occasions the lack of professional training, conservatoire education, dogmas and technical complexes proves even helpful. Such cases are very rare. Enver Izmailov is one of them. His first profession was gas welding. In school he studied the bassoon, but his main musical experience he acquired at rural weddings in Uzbekistan. Many Crimean Tatars, including Enver's family, were expelled by the "surrealistic" Soviet regime to various parts of the USSR. Many years later they have begun their slow and not easy return to the land of their ancestors. Oddly enough, the exile benefited Enver Izmailov in one respect. He had a chance to acquaint himself with Uzbek folk music, because he spent many years in ancient Uzbek city of Ferghana. Poor materially and rich spiritually, Izmailov in a bid to earn a living tried to play at rural weddings alone, without a band, and succeeded in doing so. That was his first step towards the sound monopoly, which would later offer him perfect opportunities to express his own self in music. "...This young rural musician has entranced experienced Norwegian audiences. Such celebrities as Paco de Lucia and John MacLaughlin can envy his resourcefulness and original mentality", the Norwegian press wrote after Izmailov's debut at the "Vossa Jazz" festival in April 1993. Enver Izmailov has since toured France, Switzerland, Germany and Scandinavian countries with growing success. "I don't care about publicity", says Enver. "True, I like doing concerts, but a week after another tour begins my thoughts are already in my village, with my family. I love audiences, but my music, if it can be called mine after all, is spiritually remote from big cities, though civilisation is present in it to a certain extent. At least, the electric guitar, a tribute to my rock youth, is evidence of that. In all other senses I can feel at home only in my home country, in my village in the Crimea, where I merge with nature, and where the morning breeze from the Black Sea and the smell of watermelons and lush southern vegetation stir deep emotions inside me, and I hurry to express them in sound..."